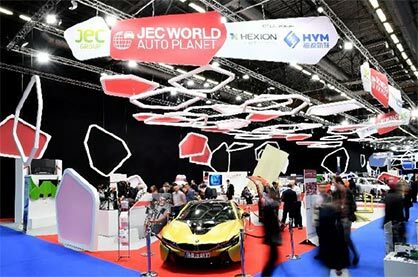 In terms of innovation, automotive professionals will be able to discover within the Auto&Transport Planet, sponsored by Hexion, Von Roll’ and Pure Michigan, more than 50 innovative parts from engine parts, to cars including an Audi A8 chassis, a carbon roof, three-wheeled vehicle…. As well as attend the pitches of the 10 Startup Booster finalists selected by Daimler, on March 12th at 11am at the Agora. Without mentioning the Innovation Awards finalists, among which in the Automotive Application category, Hexcel for its patches; in the Automotive Process category, Hyundai for its CFRP auto body panels; in the Sustainability category, Porsche for its series production of bio-based composites for doors and rear wings… Winners will be named on Wednesday at 4pm at the Agora stage.